Ann Arbor Transportation Authority board meeting (Feb. 21, 2013): The board’s meeting was relatively uneventful, but included a routine application for state funding – which this year contains a message of measured support for transit funding in Gov. Rick Snyder’s proposed budget. The resolution approved by the board includes the AATA’s view that “an increased level of state transit funding such as has been proposed by Governor Snyder would assist AATA in maintaining existing service and operating expanded transit service to satisfy the expressed public demand …” To increase funding for transportation as a general category by $1.2 billion – including roads, bridges and public transportation – Snyder’s budget would rely on proposed increases to the state’s gasoline tax and to vehicle registration fees. The Michigan state constitution requires that 90% of all fuel taxes be used to fund the maintenance of streets, roads and bridges designed for motor vehicles that use tires. Part of the remaining 10% can be used to fund public transportation operating expenses. Partly as a function of the overall increase, Snyder’s budget would increase the amount of local operating assistance for transit agencies statewide from around $166 million for each of the past two years to about $181 million. The AATA’s estimated budget for the next fiscal year (2014) is being reported to the state of Michigan as totaling $33,653,000. Those total expenses would be covered by the following breakdown of revenue estimates: federal funds ($4,276,104); state funds ($9,939,035); local funds ($12,088,861); fare revenue ($7,258,000); and other funds ($91,000). The AATA’s current year’s budget – for FY 2013, which ends on Sept. 30 – calls for $32,700,181 in expenditures. The AATA’s portion of the $166 million in state operating assistance last fall took an unexpected roughly $800,000 dip around the time the AATA set its budget for the current fiscal year. The reduction in funding relates to the way the state’s formula applies when spending is reduced by other transit agencies in the AATA’s category. AATA CEO Michael Ford told the board at its Feb. 21 meeting that he’d been to Lansing and had received assurance that an additional appropriations bill – which is currently the “placeholder” bill SB 126 – is likely to be passed, and would restore the $800,000. Meanwhile, the most recent financial update through the first four months of the 2013 fiscal year – which started in October – shows the AATA with a slight positive variance. But the AATA is operating with a level of cash reserves that equates to about 2.88 months of operating expenses. Board policy is to keep a minimum of 3 months’ worth reserves on hand. Notes to the treasurer’s report indicate that for the year, the AATA now expects about $160,000 less in fare revenues that it had budgeted – based on fewer rides being taken by University of Michigan affiliates than the AATA had projected. Besides authorizing the application to the state of Michigan for state operating assistance, the board authorized two contracts in connection with construction on the new downtown Ann Arbor Blake Transit Center – one for the elevator and the other for millwork. Both contracts were under the project’s budgeted amount for those items. The board also approved a contract for the printing of its RideGuide, a printed version of its schedules. Also authorized was a contract to perform environmental cleanup from a gas line that had been seeping at the AATA’s facility on South Industrial Highway. Updates at the meeting included notes on the board’s upcoming retreat, which is to include a discussion of AATA customer needs. That led to comments from the public asking the board to think about who the AATA’s customers actually are. During the meeting, the board also held a closed session to conduct a performance review for CEO Michael Ford. The board was asked to approve its annual application for state operating assistance under Act 51. The estimated expenses for the Ann Arbor Transportation Authority’s fiscal year 2014 budget are being reported to the state of Michigan as totaling $33,653,000. The current year’s AATA budget – for FY 2013, which ends on Sept. 30 – calls for $32,700,181 in expenditures. So the currently estimated expenses for FY 2014 reflect an increase of about $950,000, or about 3%. Sue Gott asked AATA manager of service development Chris White to come forward to summarize what the resolution was for. White explained that the application is an annual process, called for in Act 51, which includes the deadlines. For the capital portion of the estimate, the AATA uses figures from its federal capital and categorical grant program. White called the requirement to estimate a budget for next year “a little strange” – but explained that the state uses those estimates from transit authorities throughout the state for planning purposes. The AATA’s estimate, White said, is based on this year’s budget. Charles Griffith asked White about the amount of state aid estimated in the budget that’s being submitted – and whether it reflected the reduction in state operating assistance, compared to last year. White indicated that he’d used the percentages that the state had provided in its instructions. He noted that the state legislature is still looking at possible allocation of funds to make up for that reduction this year, and the Gov. Rick Snyder had proposed a budget this year with additional transportation funding. Outcome: The board voted unanimously to approve the application for state operating assistance. By way of background on the “resolved clause” in the board’s resolution alluding to Snyder’s budget, the governor’s proposal would increase funding for transportation as a general category by $1.2 billion – including roads, bridges and public transportation. To fund that increase, Snyder’s budget would rely on proposed increases to the state’s gasoline tax and to vehicle registration fees. During his oral report to the board, before the vote on the annual application for state operating assistance, AATA CEO Michael Ford told the board that he’d been to Lansing and received assurance that an additional appropriations bill – which is currently the “placeholder” bill SB 126 – is likely to be acted on and would restore the $800,000. The AATA is also working thorough the Michigan Public Transit Association (MPTA) to achieve a longer-term solution on the issue. Meanwhile, the most recent financial update through the first four months of the 2013 fiscal year (which started on Oct. 1) shows the AATA with a slight positive variance. Notes to the treasurer’s report indicate that for the year, the AATA now expects about $160,000 less in fare revenues that it had budgeted – based on fewer rides being taken by University of Michigan affiliates than the AATA had projected. Reporting from the performance monitoring and external relations committee, Roger Kerson said the AATA is operating with a level unrestricted fund balance that equates to about 2.88 months of operating expenses. Board policy is to keep a minimum of 3 months’ worth reserves on hand. Kerson noted that it was important to have a contingency, in case the state legislature does not act to restore funding. The financial pressure the AATA is now experiencing is not only due to the unanticipated $800,000 reduction of state operating assistance. The AATA chose to add some expanded services in anticipation of additional local funding sources in connection with the formation of a countywide authority. With that specific effort now defunct, the AATA is now continuing to discuss various possibilities for funding those expanded services – which include more frequent service on Route #4 (last year) and Route #5 (this year). Kerson, reporting from the performance monitoring and external relations committee, said early indications are that the Route #5 service improvements are resulting in increased ridership, like those for Route #4 had shown. The AATA’s discussions on additional local funding are taking place with the “urban core” communities, representing a much smaller area than a countywide footprint. These communities include the cities of Ann Arbor, Ypsilanti, and Saline, as well as the townships of Pittsfield and Ypsilanti. Involvement with the townships of Superior and Ann Arbor is also a possibility. At the board’s Feb. 21 meeting, Ford indicated a forthcoming meeting of the urban core community leaders on March 28. The AATA’s current position is that elected leaders need to decide for themselves what they’re willing to support, and then the AATA will in turn support that direction. That contrasts with the leadership approach the AATA had taken on the countywide initiative. The issue is somewhat complicated by the formation of a regional transit authority (RTA) late last year by the lame duck state legislature. At the Feb. 21 meeting, Ford indicated that he’d met with both Washtenaw County appointees to the four-county authority: Richard Murphy and Liz Gerber. The board was asked to approve contracts for millwork and an elevator for the new Blake Transit Center, currently under construction on Fifth Avenue in downtown Ann Arbor. The AATA had originally awarded a $139,451 contract to ThyssenKrupp for the elevator. But when ThyssenKrupp made changes to the scope of the project that had an impact on the price, the AATA decided to rebid the project. The winner of the rebid work was Otis Elevator, which offered to install an elevator for $108,100. The board was also asked to approve an $80,255 contract with SBD Commercial Interiors for manufacture and installation of custom millwork in the new transit center. The budget had allowed for as much as $120,000 for the work. 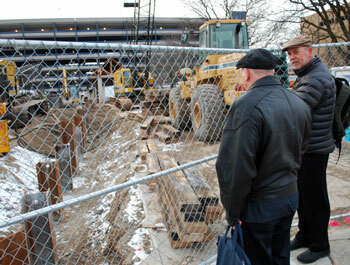 During Michael Ford’s oral report to the board, he characterized the construction of the new Blake Transit Center as on schedule with an anticipated completion date of October 2013. Asked to comment on the contracts, AATA maintenance manager Terry Black, who’s managing the BTC construction project, explained that when the AATA negotiated the final terms of the job with the contractor, there were a lot of additional terms the contractor put in – to the point that AATA decided to rebid the project. Otis Elevator’s bid then came in under what had been budgeted. Black also told the board that the $120,000 in the budget for millwork had been a placeholder, and the fact that the bid came in significantly under meant that the AATA had gained some savings on the project. Board chair Charles Griffith asked if there were additional contracts going out to bid for the construction project. [The board had already approved a few dozen construction contracts at its Oct. 18, 2012 meeting.] Black described a few other contracts, including one for the security system. The scope of work has been completed for that, and the request for proposals (RFP) is being drafted. An RFP for network cabling will also be going out, as well as one for furniture. Outcome: The board voted unanimously to approve the elevator and millwork contracts. The board was asked to approve a contract with Grand River Printing/American Litho from Belleville, Mich. to print the RideGuide. The RideGuide is an 84-page publication with bus route maps and schedule information for all Ann Arbor Transportation Authority bus routes. The board was asked to approve a one-year contract for $84,000 for printing and shipping. The contract can be renewed in one-year extensions up to five years. The AATA updates its schedule and prints new RideGuides three times a year – in January, April, and August. The cost charged by Grand River works out to about $27,600 per printing. And the staff memo accompanying the resolution indicates that the price bid by Grand River is about $0.36 per booklet. That works out to about 76,600 RideGuides per printing. Board deliberations were brief. Roger Kerson noted that Grand River was the low bidder, it was a union job and the firm had done the printing before. Outcome: The board voted unanimously to approve the contract for printing the RideGuide. The board was asked to approve a $119,980 contract with PM Environmental for remediation of contaminated soil at the AATA headquarters, located at 2700 S. Industrial Highway. Reporting from the performance monitoring and external relations committee, Roger Kerson indicated that the fuel leak problem was found during an annual inspection. The contract on the agenda was for remediation of the leak, he said. Kerson noted that the insurance company would be reimbursing the AATA for the expended amount, and there’s been close communication with the Michigan Dept. of Environmental Quality (MDEQ). When the board reached the item on the agenda, Kerson asked AATA maintenance manager Terry Black what the timelines for monitoring would be. Black explained that PM Environmental would come in and do another benchmark study, take samples, do some analysis, and determine the chemical they need to counteract the contamination. Then the company will excavate a contained area, put new soil in, and install additional monitoring wells over the next year to ensure total cleanup. That process would take over a year, Black said. Kerson wanted to make sure that the results of that monitoring are shared with the board. 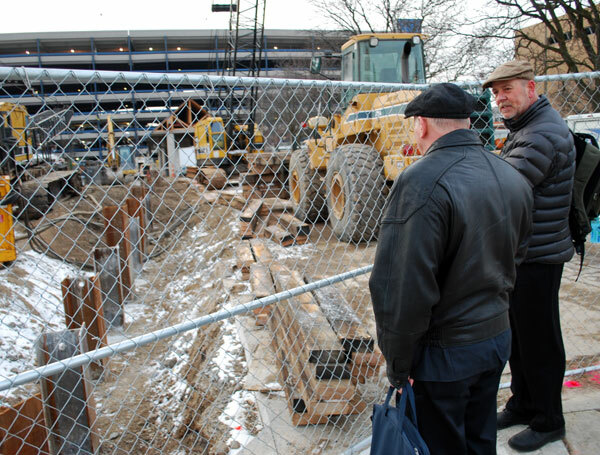 Sue Gott wanted to know how the city of Ann Arbor was kept up to speed on the work. Black indicated that the permit for the work was a mechanism by which the city and Washtenaw County were kept apprised of the situation. Board chair Charles Griffith inquired about how the leak was found. Black described how the AATA was doing an upgrade to the monitoring system for the fuel tanks. During that process, a seeping connection was discovered. It was a “reportable incident,” he said. Griffith asked how old the tanks in the ground were. AATA controller Phil Webb said the tanks are original to the building, which was constructed in 1984. Black indicated that the monitoring system now in place works 24/7. Eli Cooper asked about the life expectancy of the tanks. Black allowed that was a good question. The tanks are made of fiberglass – and as long as the AATA has monitoring equipment, the AATA thinks it’s ok. Outcome: The board voted unanimously to approve the contract for soil remediation. The board held a closed session for the evaluation of CEO Michael Ford’s performance. It lasted about 45 minutes. For the last 10 minutes or so, Ford was invited into the closed session to join the board. Ford’s last annual evaluation and contract revision was done on Dec. 15, 2011, when the board authorized an increase in base salary of $4,800 to $164,800 annually. Outcome: The board did not vote on a resolution regarding Ford’s contract. On emerging from the closed session, they came back into open session only for the purpose of adjourning the meeting. At its Feb. 21 meeting, the board entertained various communications, including its usual reports from the performance monitoring and external relations committee, the planning and development committee, as well as from CEO Michael Ford. The board also heard commentary from the public. Here are some highlights. Comm/Comm: Retreat – Who are the AATA’s customers? In his oral report to the board, CEO Michael Ford said that the board’s planning and development committee (PDC) is beginning to shape the agenda for the annual board retreat, which will take place in May. Reporting from the PDC, committee chair Sue Gott confirmed that the last committee meeting had included discussion of the retreat. The consensus of the committee, which besides Gott includes Eli Cooper and Anya Dale, was in favor of a retreat that was oriented less toward reports and presentations and more toward interaction and discussion among board members. Gott has created a file on the retreat, which she held up to show the board, and had already included a lot of material from staff. Gott called the retreat an important opportunity for the board to look forward and be visionary. She noted that Cooper had suggested looking at the AATA “customers” and focusing on their needs. During public commentary at the conclusion of the meeting, Jim Mogensen picked up on the idea of the AATA’s customers, asking: Who are the AATA’s customers? Is it the people who are already living in the urban core area, or is it the people who are commuting to the urban core area? Mogensen saw the issue of extending AATA service to the University of Michigan’s East Ann Arbor Medical Center – on Plymouth Road east of US-23 – as “a five- or six-figure problem.” When it was finally resolved, Mogensen said, it would probably be on the lower end of that estimate. He felt that eventual operation of the connector service was a “seven- or eight-figure problem” for the university. If there was difficulty in figuring out how to maintain the Chelsea Express service – which Mogensen called a “six-figure problem” – he wondered how the much larger challenge of the connector service would be solved. At the board’s Jan. 17, 2013 meeting, Jim Mogensen had addressed the board, saying that he wanted to make sure that people were aware that the “urban core” transit plan would need to have a Title VI review – and because it might involve a reduction in service, it could be more complicated. He also had pointed out that there’s an April 2013 Federal Transit Administration deadline for a three-year plan that includes a public input process. He’d wanted to make sure that the AATA was aware of that and to make sure it happens. He didn’t want it to get lost in the shuffle. So at the board’s Feb. 21, 2013 meeting, Mogensen addressed the board saying that based on a conversation he’d had with Chris White, AATA’s manager of service development, he understood that there had been some follow-up by the AATA staff on the question of the deadline. And Mogensen had the understanding that there’d been miscommunication between different levels of the FTA. He indicated he was satisfied that the April 2013 deadline wasn’t applicable to the AATA, but wanted to make sure that the AATA documented that on the record so that it’s brought out and made clear. After the meeting, White clarified to The Chronicle that the AATA must submit a service plan to the FTA every three years, and it had last submitted one in December 2011. So AATA’s next plan must be submitted in 2014. In his oral report to the board, CEO Michael Ford gave an update to the board on the north-south commuter rail service known as WALLY (Washtenaw and Livingston Railway). [The AATA received a federal grant last year, at its Aug. 16, 2012 meeting, to proceed with station location design.] Ford described how the work on station location design is proceeding. The project is currently undertaking station location studies for five communities: Ann Arbor, Whitmore Lake, Hamburg Township, Genoa Township and Howell. In Ann Arbor, attention is focused on the Barton Road location and how a station can be designed that overcomes the constraints imposed by a large drainage culvert. Future phases would also include detailed designs of each site selected in the initial phase, with additional station sites in Ann Arbor – a downtown location (probably between Liberty and Washington streets, according to a staff memo) and one near the University of Michigan football stadium. Ford’s written report to the board describes being encouraged to meet with Ward 5 Ann Arbor councilmembers Chuck Warpehoski and Mike Anglin. The report’s phrasing seemed intended to convey that a possible location for a station was in their ward. However, the wording did not accomplish that: “We were encouraged to meet with Fifth Ward Councilmembers Chuck Warpehoski and Mike Anglin whose project this is.” At the council’s Feb. 29 19 meeting, Anglin spoke in vague terms about information that had been circulating. He said the information suggested that he was supportive of the WALLY project – when he is not. It’s possible that Ford’s written update was the source of the confusion. In his oral report to the board, Ford indicated that external testing of the AATA’s new website had begun that week. It will continue until the beginning of March. Ford also reported that for the fourth month in a row, a zero balance was owed to Michigan Flyer for the operation of the Ann Arbor to Detroit Metro airport service, called AirRide. That’s despite a post-holiday decline in ridership. Ford described how a meeting with Detroit Metro Airport officials had resulted in an agreement that a link to the AirRide service would be added to the airport’s website. During his report from the performance monitoring and external relations committee, Roger Kerson mentioned the possibility of eliminating the University of Michigan campus stop as a way of saving some money. Rebecca Burke reported from the AATA’s local advisory council (LAC), a group that provides input and feedback to AATA on disability and senior issues. She said that AATA manager of service development Chris White had given the group a presentation AATA’s application for operating assistance, and how it pertains to the A-Ride program, a shared-ride transportation service for people with disabilities. Thomas Partridge complained about the limited thinking and limited vision of local government leaders. He told the board that he’d gone before the Ann Arbor city council and called for the recall and resignation of those who’d appointed the AATA board. He complained about “high-income managers” with 30 years of seniority who felt they were entitled to lifetime employment. This is the first I’ve heard of a proposed location for a downtown train station. Last I heard the AA Railroad was opposed to running passenger trains on its tracks. Has there been any progress there? Wouldn’t the First & William lot be a better location? It’s closer to Main Street, and the station could be built so it faces the right way. A station behind the Blind Pig would presumably have to face toward the City owned lot behind it. The track from the Barton Road location southward is owned by the Ann Arbor Railroad, which has historically been uninterested in passenger rail use on it tracks. But in the fall of 2011, AARR indicated at least a willingness to entertain a “business proposition” on such use. Some kind of arrangement would be necessary in order to contemplate stations south of Barton Road – like downtown or the football stadium. And since then a deal was announced late last year that Watco, a Kansas-based company, would be purchasing the railroad from AARR. Last I checked in with AATA on the topic a few weeks ago, they hadn’t had yet had any substantive talks with Watco on use of the tracks for passenger rail. Re (2) The March 2013 issue of the Ann Arbor Observer includes an article about the history and future of the Ann Arbor Railroad tracks (at page 37). Of interest to any discussion of WALLY, the author notes that she asked the Executive VP of Watco whether that company was interested in allowing commuter service on its AARR tracks. The Executive VP “provided little encouragement” for commuter rail. Reportedly, Watco is willing to listen. That the Ann Arbor Observer knows this information but the AATA seems unaware reinforces the suspicion that AATA is incapable of responsible spending on its planning. This is all too reminiscent of AATA’s planning for the Countywide transit authority without knowing whether any other community was interested in contributing to the cost of the planned service. (a.) Is the staff memo about station locations available? (I gather this is different from the notes for the Planning and Development Committee meeting that preceded this board meeting. (b.) What I found startling when the WALLY station design was discussed at the PDC meeting was that the downtown station was now the top priority in design work. Barton would come second. Since no business arrangement for use of the tracks (let alone any funding, etc.) has been reached, I wondered what inspired this. The PDC notes quote Eli Cooper as appreciating the staff flexibility in prioritizing the downtown station. This implies that the decision was made in city hall. What is going on? (c.)Anglin spoke on February 29? Remarkable. Isn’t it a scandal that less than 22% of the cost of AATA operations are covered by beneficiaries of those services (the riders). [7.258 million/33.653 million] Users of other types of transportation including private automobiles would love to get that kind of sweet deal from the taxpayers. Of course all subsidies mean higher taxes for the taxpaying public. I do not think it is morally right for taxpayers of modest means in Ann Arbor to be paying a big chunk of the transportation costs for well-off, privileged UM Students. Property taxes in Ann Arbor are already too high and they make it difficult for who are not getting big salaries or wealthy to live here and cope financially. Does AATA expect these large subsidies for their business operations to continue indefinitely? This is a very important question that needs to be debated publicly and answered. #5. Cars do get a big subsidy. When you pay $1.60 an hour to park in the Ann Arbor parking structures, that does not come close to paying for the cost of that parking spot. Likewise, highways, freeways, roads, etc. are not completely paid for via the gas tax that car drivers pay for when they fill up their cars with gasoline.